I Escaped from Devil's Island is a 1973 exploitation film about an escape attempt from Devil's Island. Roger Corman and Gene Corman produced this grim adventure saga which bears more than a passing resemblance to Papillon. Prison life on Devil's Island is no picnic so fellow prisoners Le Bras (Jim Brown) and Davert (Christopher George) go AWOL. Along their escape route, they encounter submissive native women and a colony of lepers. 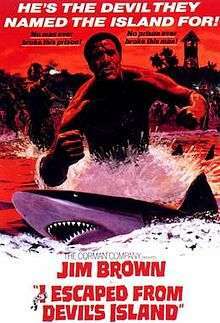 Jim Brown was signed to make the film in December 1972. Martin Scorsese says that Roger Corman offered him the chance to direct the film following Boxcar Bertha. "The idea was if you shoot it fast enough, you could release the film before Papillon," he said. "I was still very keen on genre films." However Scorcese decided to make Mean Streets instead. Filming started in April 1973 in Acapulco. The producers of the similar film Papillon (1973) sued for copyright infringement but were unsuccessful. Shout Factory is releasing I Escaped from Devil's Island on DVD and Blu-ray on July 15, 2014.